The "budged iPhone" bit like the Loch Ness monster – people keep talking about it, showing photo evidence and others keep debunking it. The G for Games team decided to do some cyber-sleuthing and uncover the truth behind some of those leaks. What they discovered is not too shocking – the colorful backs in some photos of the "budget iPhone" are just back panels manufactured by an unrelated (to Apple or Foxconn) Chinese company. You can even buy one if you like for $67. The second part of the investigation is somewhat more interesting as it focuses on photos that show the front of the "iPhone" (so it's not just a plastic case). 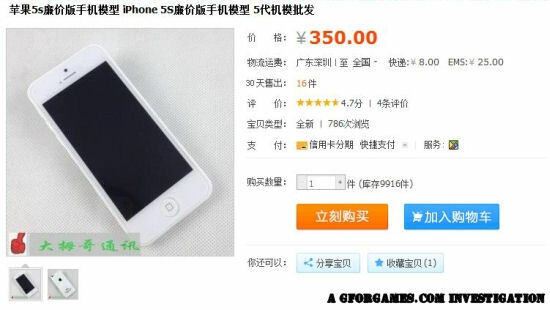 That, however, turned out to be another thing on sale in the Chinese online shops – a dummy "iPhone 5S" that can be yours for $52. The page tries to make it sound like a real device that wasn’t completed because Apple decided to change the design midway. Yet thee more likely scenario here certainly is that it's just a knockoff. Of course, none of this should come as a surprise – we already knew that a company, Techdy, was selling Android-powered device (with Snapdragon 600 and everything) that look just like the leaked budget iPhone. If this is a marketing strategy, it's a clever one – plenty of free exposure by various tech blogs and people eager to read about Cupertino's next. Anyway, you can read more details of the G for Games investigation and their correspondence with one of the makers of the back panels. Not that difficult to recognize. Don't make him think too hard. He's still trying to get his head around how to read graphs.